ELEANOR P. LABROZZI PHOTO | William Johnston Jr.’s casket aboard the Fire Department’s 1929 fire truck that took it from his funeral service at Our Lady of the Isle Church past his home in the Center to the cemetery on Monday. The Shelter Island community this week mourned the passing of one of its most well-loved members. Harelegger William Johnston Jr. died on August 5, 2011 in his Manhanset Road home, with family and friends by his side, just two days after his 86th birthday. Everyone who speaks about William “Scratchy” Johnston Jr. — his wife, his children, his friends — all agree that what he loved to do most was get on that bulldozer. It was his hobby, his passion, and he was famous for it. Mr. Johnston’s survivors also include a son from a first marriage, William “Punch” Johnston III, who is the “son” of the family business, Johnston & Son Earth Moving, and who lives with his wife, Maryann Koch, on Shelter Island. Another son from his previous marriage, John Francis Johnston, died on the West Coast in a car accident in 1998, Mrs. Johnston said. Mr. Johnston is also survived by his stepsons, Michael Foster and his wife Sonya, Dana, and Dean Foster and Dean’s wife, Shannon, and grandchildren, Nolan, Audra, Bailey, Colton and Kaylin. Born on Shelter Island to William Johnston Sr. and Phoebe Simons in 1925, Mr. Johnston was twin brother to Williette Piccozzi of Shelter Island, who survives him. Mrs. Piccozzi was the older twin because, according to Mrs. Johnston, her husband “always said he was a gentleman and let the lady go first.” His other sisters, Janet Zabel and Rosemary Griffing, both live on Shelter Island. His brother, Francis, and sisters Isabel Bowditch and Gracie Silvani predeceased him. He is also survived by numerous nieces and nephews. The viewing and Firematic Service was on Sunday, August 7, at the Shelter Island Funeral Home and a Mass was celebrated on Monday morning, August 8 at Our Lady of the Isle Roman Catholic Church, where Mrs. Johnston works as a secretary. Father Peter DeSanctis and Father Vincent Youngberg, CP, officiated at the service. 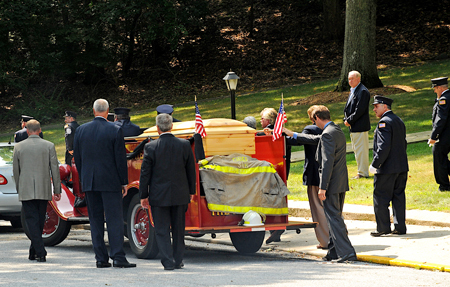 Following the service, Mr. Johnston’s plain coffin was placed on the 1929 Heights fire truck, along with his fire jacket and helmet, for the ride from the church, past the home he built and on to the Catholic cemetery, passing under a large American flag suspended from a ladder truck at the corner of Cobbetts Lane and Manhanset Road. Mr. Johnston served as chief of the Heights Fire Department for several years, was named Fireman of the Year in 1982 and was honored in 2009 for 65 years of volunteer service with the Fire Department. “They sounded the siren when the fire truck went past the house,” Mrs. Johnston said on Monday afternoon as she sat in her kitchen, surrounded by dozens of pictures of her husband through the years and a number of plaques he had been awarded. While she reminisced, her sons Dean and Dana passed through the room, and at one point she had summoned her grandson, Nolan, to handle a noisy little dog that kept barking at a hospice employee who was there to remove equipment from the house. “He always cooked the corn at the chicken barbecues,” Mrs. Johnston said, going through a box of pictures of her husband and corn. “He was in charge of that corn. For years he did the corn. Even when he shouldn’t have.” She was referring to more barbecues when his health was an issue. And he was always smiling,” she said, as she pointed from one picture to the next. Each showed a man with a direct gaze and a friendly grin. He loved animals and he loved kids. He came from a big family and he had a lot of friends, “everyone who knew him loved him,” she added, noting that during the week before he died many of those people came to their home — with its “locals only” sign in the kitchen — to spend a few minutes with him. Supervisor Jim Dougherty, before calling for a moment of silence at the Town Board work session on Tuesday in memory of Mr. Johnston and Governor Hugh Carey, who died on Sunday, proclaimed August 11 a day of mourning in town for both men. Almost six years ago, in December 2005, the Reporter wrote an article about Mr. Johnston, “the long-time Island earthmover,” and how he got back on a bulldozer after a two-year hiatus that involved several surgeries. At that time, his son, William “Punch” Johnston III, was completing work at the new clubhouse at Gardiner’s Bay Country Club. One of his close friends, Gene Shepherd, also a heavy equipment operator, said that Mr. Johnston built miles of roads on the Island, “all of Hay Beach,” he said, and probably every road built here since 1944. They were friends “since 1959, when I came out here,” Mr. Shepherd said, but they worked together, too, beginning almost 50 years ago. At that time Mr. Johnston worked at Shelter Island Contracting, Trucking and Dredging Corporation (SIC&T, aka “Sick and Tired” by locals), the business owned by his sister Isabel and her husband, Harry “Hap” Bowditch. Mr. Shepherd became his co-worker in 1965 and “the rest is history,” he said. Then, after Hap sold the business, Mr. Shepherd said, “Scratchy and I still worked and traveled a lot together,” with Mr. Johnston on the bulldozer and Mr. Shepherd operating the crane — and not just on Shelter Island but off-Island in places such as Glen Cove, Dix Hills, St. James and Montauk. He was a true friend to his son, too. But not when it came to spending time with his father. The two of them had lunch together the Friday before Mr. Johnston died, his son said. They started working with each other back when his father was employed by his Uncle Hap, he said. That business was sold and Mr. Johnston worked for several businesses before he decided to become his own boss. His father was 50 years old, he said, when he started Johnston & Son Earthmoving in 1977 and “the son” joined him in 1978. “We worked together except from October 1966 to October 1968, when I was in the Army,” Punch said. That’s one of the reasons he thinks he’ll retire Johnston & Son Earthmoving, probably next year. He said it’s really a two-man operation. “I can’t work with anyone else. I worked too many years with my dad,” he said. Those who wish may make donations in William Johnston’s memory to the Shelter Island Fire Department, P.O. Box 613, Shelter Island, NY 11964, Our Lady of the Isle Roman Catholic Church, P.O. Box 3027, Shelter Island Heights, NY 11965 or East End Hospice, P.O. Box 1048, Westhampton Beach, NY 11978-7048.